MLB Pipeline announced their 2019 top 100 prospect list on Saturday evening. San Diego Padres broke the record for the most prospects in the top 100 with 10. Francisco Meija, who arrived in the Brad Hand trade last season, is one of San Diego’s new top 100 guys. Atlanta Braves have eight top 100 prospects, just like they did last season. The graduation of Ronald Acuna to Major League stud means Atlanta are without a top 20 prospect, but their farm is still very deep. They rank second overall, led by Mike Soroka (24th) and Kyle Wright (30th) who both made their big-league debuts last season. Chicago White Sox, Houston Astros and Tampa Bay Rays all have six in the top 100. Houston, despite trades and being a contender in recent seasons, have retained many of the prospects from their long rebuild. The Astros have a pitcher, Forrest Whitley, and a hitter, Kyle Tucker, in the top 10. No other team has that. The 2017 champions have a further four prospects on the list, including three more right-handed pitchers. We are likely to see Whitley, and perhaps a couple of the others, in the Majors this season as Houston look to replace Charlie Morton, Lance McCullers Jr. and Dallas Keuchel. The White Sox actually rank ahead of Houston on the team list. The southsiders have two top 20 prospects, Eloy Jimenez and Michael Kopech (who is out for the season), along with the right-hander Dylan Cease at 21. Last year’s first-round draft pick Nick Madrigal comes in at 47, seven places behind exciting outfielder Luis Robert. Dane Dunning is the sixth White Sox player on the list, ranking 80th. Tampa Bay’s farm edges the Astros out for fourth spot. Shortstop Wander Franco, who is just 17-years-old, slots in at 13th on the overall list. Brent Honeywell is coming off Tommy John surgery and is one place ahead of Brendan McKay in 28th. McKay is the only two-way player in the draft, though his pitching may see him make the Majors before his hitting is ready. 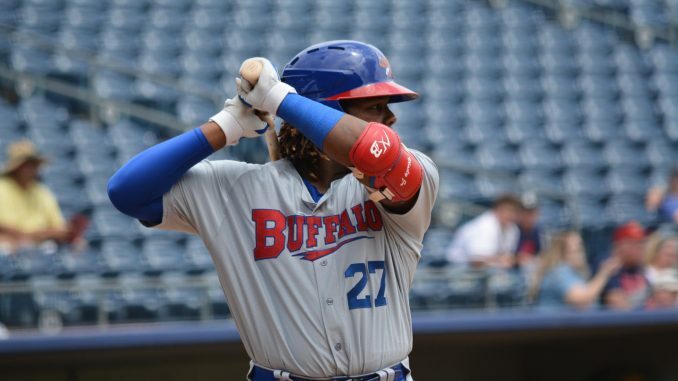 The top spot belongs to Vladimir Guerrero Jr. Toronto have the sixth-strongest farm, with Guerrero Jr. set to take over as the face of the franchise this summer. Another son of a former Major Leaguer, Bo Bichette, sits 11th on the top 100. Bichette and Guerrero Jr. could be Toronto’s core for the next decade. San Diego’s Fernando Tatis Jr. is just behind Vlad, after posting a .862 OPS in AA last season. Tatis has the potential to become an MVP contender. He is at least a solid defensive shortstop with a bat that could take the Majors by storm. Jimenez follows in third. He is an offensive force at the plate, but his future could yet be as a DH, having regressed to a below-average defender and runner. The Nationals’ Victor Robles rounds out the top four. Robles will have a big role to play for Washington this season alongside 2018’s rookie sensation Juan Soto.